Canada has just taken a bold, unilateral step by announcing it will no longer fund the United Nations Relief and Works Agency for Palestine Refugees in the Near East (UNRWA). This move will undoubtedly draw the ire of Palestinian supporters who consider such financial aid essential and sacrosanct. Nevertheless, UNRWA has drawn criticism for decades, and at the very least, the organization has needed a shake-up for a long time. Canada, it should be remembered, was present at UNRWA’s birth in December 1949; indeed, the agency’s first director was a Canadian*. That Canada should be the first major donor to pull out of UNRWA funding is significant at many levels, and the move will undoubtedly affect G8 support of the organization. The real challenge, however, may be the present Conservative government's ability to survive long enough to see any change. Many expect the Conservatives, whose draconian domestic policies have ruffled feathers across Canada's left-leaning populace, to lose the next Federal election. Support for the Conservatives, which presently rules with a minority government, has been falling. A recent poll shows them essentially tied with the Liberals who, if in power, would almost certainly reverse the UNRWA decision. The National Post has an editorial on the decision here. 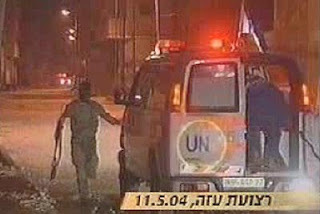 loading weapons into a UN ambulance. Here are a few articles for background information on UNRWA's controversial history. Posted by Morey Altman at 1/27/2010 03:08:00 p.m.